Are printer companies gouging us on laser toner pricing? Your monochrome laser printer is supposed to be stress-free: sturdy, reliable, less complicated than a color laser, and not as costly to run as a color inkjet. Unfortunately, however, you may be paying considerably more to keep your laser printer filled with toner these days than you did earlier in the printer's life. I looked at 22 monochrome laser models that we've tested over the past three years, and compared their toner costs per page at the time of our reviews with their toner costs today. To determine the latest prices, I shopped online, starting with the sites of major office superstores (Office Depot, OfficeMax, and Staples), and sticking with other established players (such as CDW and NewEgg) whenever possible. Of course, if your office has a service contract or some other special arrangement for your printer supplies, you're likely getting a much better deal than the public retail price. During my research, I discovered that the costs per page for models from Dell, HP, and Lexmark had bumped up in small increments of between 2.2 percent and 5.8 percent in the time since we reviewed them. Meanwhile, models from Brother, Samsung, and Xerox that PCWorld had reviewed showed cost-per-page hikes of anywhere from 5.5 percent to a whopping 28 percent. Considering that the cumulative rate of inflation from 2009 to 2012 is just 7 percent, the sharply higher costs imposed by some vendors appear particularly egregious. 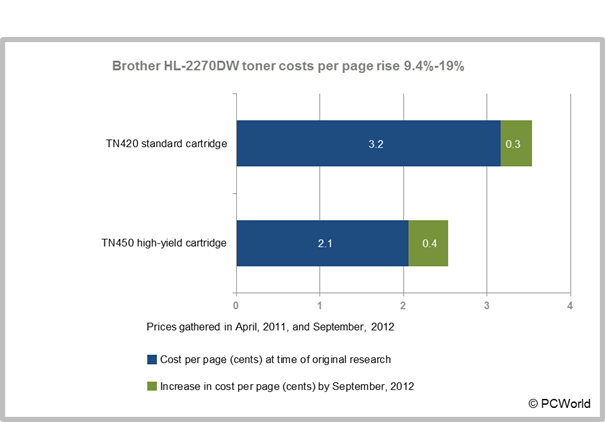 When we reviewed the Brother HL-2270DW last year, we warned readers that its toner costs per page were high—as is typical of products that carry modest price tags. Unfortunately, the printer's cartridge prices today are even higher. The standard-size TN420 cartridge had a cost per page of 3.2 cents in April 2011. Today that figure is 3.5 cents, a 9.4 percent increase in less than 18 months. Meanwhile, the high-yield TN450 cartridge's cost per page has risen from 2.1 cents per page to 2.5 cents per page in the same period—a 19 percent increase. The closely related Brother HL-2280DW uses the same toner cartridges. 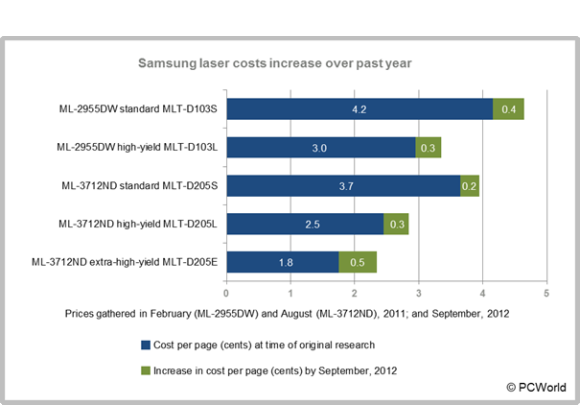 We based our original cost-per-page numbers for the low-end Samsung ML-2955DW and the small-business Samsung ML-3712ND on estimated street prices that the vendor provided less than a year ago. I did my own research to find the most recent prices. Samsung's original prices would fall at the low end of the current average, indicating that prices are trending upward overall. Based on the data that Samsung provided last year, the ML-2955DW's standard-size toner cartridge originally had a cost per page of 4.2 cents. The current average is 4.6 cents per page, a 9.5 percent increase. The printer's high-yield cartridge initially cost 3.0 cents per page, but the current average is 3.3 cents per page—a 10 percent jump. The Samsung ML-3712ND accepts three sizes of toner cartridge. With Samsung's provided pricing matched against my current research, the costs per page has increased from a reasonable 5.4 percent for the standard-size cartridge, to a whopping 28 percent for the extra-high-yield cartridge. The cost per page for any printer's extra-high-yield cartridge tends to dwell somewhere below 2 cents, but the ML-3712ND's average is now above that number. The other vendor that showed noticeable increases in toner cost per page was corporate-minded Xerox. Three of its monochrome lasers that we reviewed a little over three years ago remain available today. Their cost increases since 2009 range from 5.5 percent to 19 percent. 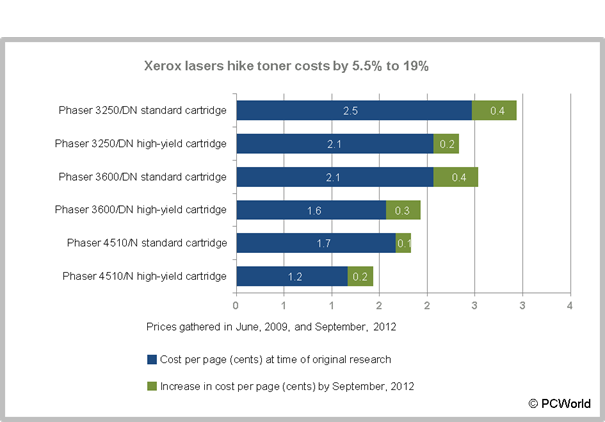 The most hard-hit model is the mid-range Xerox Phaser 3600/DN model, whose high-yield cartridges rose in price by 0.3 cent per page. Why are some vendors holding prices fairly steady, while others are raising them? A spokesperson for Xerox cited the challenging world economy, along with currency fluctuations, as major contributing factors to Xerox's price hikes. According to IDC's Keith Kmetz, there are numerous reasons underlying increases in toner prices. The weak worldwide economy, environmental concerns, and the rise of paperless alternatives such as smartphones and tablets, have contributed to a drop in the overall number of pages being printed. In response, some vendors have increased their cartridge prices in hopes of generating greater profit margins and revenue out of the pages that are being printed. Retail prices have seen the most upward pressure, notes IDC. Another macroeconomic factor is currency: The stronger Japanese yen and the weaker U.S. dollar have affected the many Japan-based printer vendors. In addition, IDC points out that costs for cartridge raw materials and for transport are increasing. As I said when I examined rising inkjet cartridge costs in May, the vendors with the largest inkjet market share—namely HP and Canon—have tended to be more stable in their pricing of consumables. The same seems to hold true for the largest monochrome laser printer vendors: The biggest ones—Dell, HP, and Lexmark—may rely on their strong customer bases to bolster their bottom line, even in hard times. Lexmark says that its laser business remains healthy, for instance, even as the company recently chose to discontinue its faltering inkjet business. The monochrome laser printer is still the most economical printer choice around, if only because it's simple and straightforward. You may find greater cost stability if you stick with the market leaders, because they're better equipped to weather rough economic times. Editor's note: This article was corrected. The chart showing Samsung toner costs had the names of two toner cartridges switched. The erroneous chart has been replaced with a corrected one. PCWorld regrets the error.